Sam Bowen has had his opponent confirmed ahead of his next fight. The Leicester Jr. Lightweight will return to the ring this weekend, exclusively live on BT Sport. 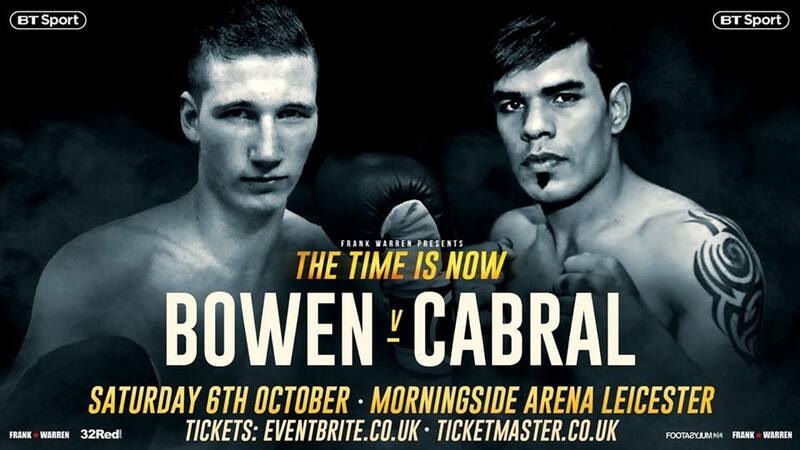 Bowen had been set to defend his British title in his first fight under his new promoter Frank Warren. ‘The Bullet’ will face Argentina’s Horacio Alfredo Cabral on Saturday. The vacant WBO Inter-Continental crown at 130 pounds will be at stake at the Morningside Arena in Leicester, as part of the supporting cast to Jack Catterall’s WBO Jr. Welterweight title eliminator against Ohara Davies. Cabral has a record of 21-2 with eight early and was last in action in April when he lost a defence of his WBC International Silver title. Double Olympic champion Nicola Adams will face Isabel Millan for the vacant WBO interim Jr. Bantamweight female title on the bill, billed ‘The Time Is Now’, while English heavyweight champion Daniel Dubois faces a step-up against America’s Kevin Johnson on the same card as Nathan Gorman and Joe Maphosa return and Lyon Woodstock’s clash against Archie Sharp in a defence of his WBO European super-featherweight crown. James Branch, Mark Heffron and Ryan Hatton are also set for action on the bill.